CEREC crowns remake decayed, injured or malformed teeth in one dental visit. Customized by your dentist in Washington, DC, Dr. Yelena Obholz, CEREC crowns restore oral function and beautify your smile without long wait times or messy oral impressions. The results are simply amazing! CEREC means Chairside Economical Restoration of Esthetic Ceramics. Dr. Obholz uses this technology at Aesthetic & Family Dentistry of Washington to remake smiles compromised by deep decay, injury, malformation, or multiple fillings. Additionally, CEREC dental crowns in Washington, DC restore dental implants or teeth treated with endodontic therapy. CEREC imaging, computer design software and chairside milling (CAD-CAM) produce lifelike crowns in about an hour. A patient with a compromised tooth comes to the dental office and leaves with a great restoration that has perfect bite, aesthetics and functionality. After a complete oral exam and digital X-rays to determine if a crown is the right restorative treatment, the dentist removes decayed enamel and filling material from the tooth. She uses an intraoral camera to image the tooth and to make a three-dimensional optical impression. There’s no messy impression putty or cumbersome trays. The dentist uses the optical impression and special software to design a crown that is shaped and shaded to blend perfectly with the individual’s smile. The CEREC milling machine uses Dr. Obholz’s instructions to make the crown from a solid block of dental grade porcelain. This material is very durable and lifelike. The milling process happens right in the treatment room and takes only 15 to 20 minutes. The patient may actually view the crown as it is milled. When the machine has finished the restoration, the doctor polishes and shades the CEREC dental crown and bonds it permanently to the re-shaped tooth. Unlike other kinds of dental crowns in Washington, DC, CEREC crowns fit perfectly right out of the milling machine or no adjustment. The crown matches adjacent teeth in color and bite. 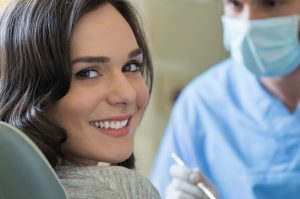 Plus, patients don’t need to wear nuisance temporaries or wait weeks for restorations to come back from the dental lab. The CEREC process is quick and creates a superior restoration. There are no dark lines at the gum line common to porcelain and metal crowns. Furthermore, CEREC crowns are durable. With daily flossing and twice daily brushing, along with six-month exams and hygienic cleanings with Dr. Obholz and her team, these restorations remain in service for a decade or more. They give patients bright, natural-looking smiles. And, whenever possible, a dental crown is superior to extraction. If you need restorative dental services, contact Aesthetic & Family Dentistry of Washington. The dentist will evaluate your oral health needs and answer all your questions about CEREC crowns.